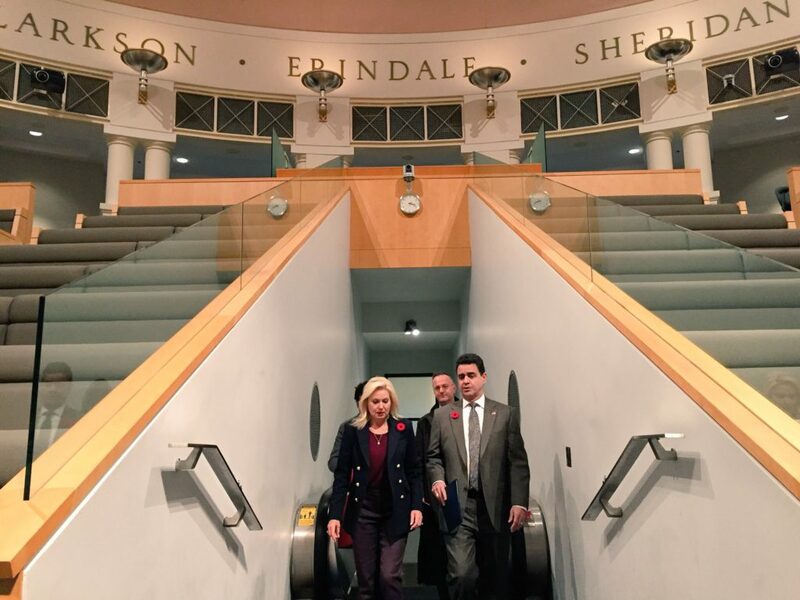 Mayor Crombie meets with US Consul General Juan Alsace at Mississauga City Hall. “On behalf of the City of Mississauga, Members of Council and our team of professional staff – it gives me great pleasure to formally welcome Consul General Juan Alsace here to Ontario’s third-largest city and Canada’s sixth-largest city. “It goes without saying that Canada and the United States enjoy a strong, proud and enduring relationship. “I have had the good fortunate to live in some of America’s most dynamic and vibrant cities including Boston and Los Angeles. “I have also had the opportunity to work for legendary American businesses including McDonald’s and Disney. “I have seen firsthand America enterprise, opportunity and innovation at its best. And I have worked alongside some of America’s brightest and boldest minds in business. “There are a number of important milestones in history that forged today’s relationship between our two countries. “This includes economic prosperity; cultural and sport achievements; and peacekeeping efforts throughout history. “It is only fitting that we welcome Consul General Alsace – and mark the importance of the Canada-US relationship – during the month of November. “On Saturday, we commemorate Remembrance Day in Canada and Veterans Day in the United States. “For decades, Canadian and American soldiers have fought side-by-side and bravely sacrificed their lives so that we could all gather this day as citizens of free, law-abiding and peaceful communities and nations. “Today is another opportunity for Mississauga to further cement its important and enduring relationship with the communities of the United States. “We need to work more closely together to maintain the strong economic ties that bind Canada and the United States together. “Bilateral trade in goods and services reached nearly $630 billion in 2016. “A strong and globally competitive US economy works for Canada and the entire world. “Every level of government and the private sector have a role to play in achieving and maintaining this competitiveness – especially municipalities. “Next week I will be in New York City alongside a delegation of municipal leaders to launch Toronto Global in the United States. “Toronto Global is a new foreign-direct investment agency representing municipalities in the Toronto Region. “Mississauga is working with Toronto Global on a number of important initiatives including our bid to secure the new Amazon second headquarters – HQ2 – located right here in our downtown. “I will bring my remarks to a close with a question to you Consul General, and everyone here: What more can municipalities do to strengthen relations and economic competitiveness between Canada and the United States? This entry was posted in Carousel News, Mississauga International Partnership Program, News. Bookmark the permalink.